A wood floor can be a durable and beautiful investment, but in the same way, that its beautiful appearance draws homeowners and builders, its natural structure draws and releases moisture from its environment. Wood is a hygroscopic material, and its natural makeup means that it constantly interacts with its environment, absorbing or releasing moisture depending on the ambient conditions. For wood flooring, it means that if the balance between the external moisture conditions and the internal moisture content (MC) levels are too different, it can lead to problems with cupping, crowning, gaps between boards, or even lifting from the subfloor in extreme cases. All wood will, over time, adjust to its surroundings, in a process known as equalizing. Understanding that give-and-take moisture process, and controlling the rate at which it happens, means that with some precautions at each stage of the lifespan of wood, moisture does not have to lead to flooring problems. When “green” or fresh cut lumber comes into a mill, the first thing that must be addressed is the moisture level of the wood. Because MC can affect everything from dimensions to curl, excess moisture must be removed to get the lumber to a predictably workable condition. Professionals typically accomplish this through large kilns that use a combination of heat and air flow to remove excess wood moisture. 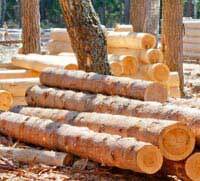 Sawmills invest a great deal of time and money into optimizing this process so that every piece of lumber can be at its best quality possible. Moisture measurement is critical for top-notch grading of the lumber, quality and production. From there, it moves on to the wood flooring manufacturer, where moisture measurement is just as crucial to the end product. For solid wood, laminate, or even engineered wood flooring, excess moisture, or even an over-dry factory environment, can mean splitting, cracking, warping, an adhesive failure between layers, or generally substandard flooring. Here as well, moisture measurement is crucial. All the best intentions of the manufacturer can be undone, though, if the finished product is exposed to excessively wet, humid or dry conditions after it has been made. For the manufacturer, the distributor, the installer, and the homeowner storing a wood floor needs to have the same attention to moisture conditions as was established at the manufacturer’s facilities. How is that best done? A controlled environment is best for both long-term and short-term storage. Wood flooring is typically dried to between 6–12 percent MC (depending on the manufacturer and the species). In any storage location, both temperature and relative humidity (RH) must be stable and near service conditions to prevent extreme shifts in the flooring’s MC. Ideally, flooring left in its manufacturer’s packing and in a controlled environment will experience little change. Periodic checks of the wood flooring with an accurate moisture meter and a thermo-hygrometer for measuring ambient RH and temperature conditions of the environment is the best insurance against potential problems. When preparing for installation, wood flooring must also equalize with the job site. The ultimate goal is to minimize the impact of the seasonal and daily changes the floor will be exposed to. Strictly focused on equalizing the wood flooring prior to installation will do much to prevent moisture-related flooring problems and extend the life and look of the floor. When flooring is delivered to the job site, the site should be at service conditions with HVAC systems operating and the area enclosed. Flooring should be randomly checked for initial MC levels and be left to equalize, or acclimate, with the site. To speed this process, boards can be stacked in loose crisscross stacks to allow the air to move more freely between each board. Fans can also help with air movement. The subfloor should also be tested with a wood moisture meter (for wood) or RH testing (for concrete) to be sure it is at the right moisture level too. It is not recommended to stack wood flooring directly on a concrete subfloor. The only way to accurately determine when the flooring is equalized and ready for installation is with an accurate moisture meter set for the appropriate species of the wood flooring. When the MC readings have stabilized to the environmental conditions, the flooring is ready for installation. Once a wood floor has been installed, it is still important to routinely check the floor for signs of moisture intrusion. Some seasonal changes like small gaps are normal, but any prolonged contact with external moisture can still impact the floor’s performance. Leaking plumbing or appliances, ground water intrusion or severe and prolonged shifts in humidity can all take their toll on a wood floor. 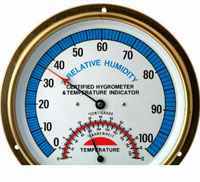 A wood moisture meter can help to spot problem areas before they become an irreversible problem.